CLARK, Alson Skinner (1876-1949) was born in Chicago of a prosperous family comfortably supported by the father's commodities business. He showed early art talent, which his family encouraged by enrolling him in evening classes at the Art Institute of Chicago. They also took him on a two-year trip around the world where he gained much exposure to European art. Clark developed his talents a landscape painter strongly influenced by the French Impressionists. 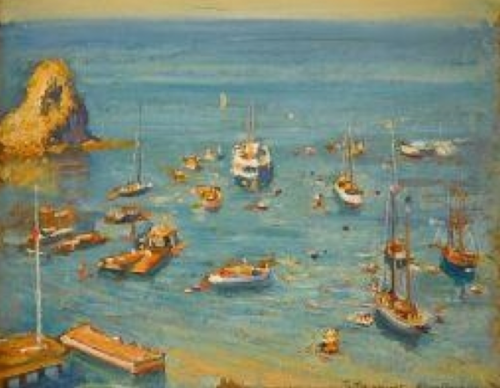 He spent much of his career traveling and living in foreign countries, including Paris, France, before settling in Southern California where he became a plein-aire painter, art educator and muralist. He also traveled extensively in Mexico and the Southwest. His memberships in arts organizations included the Pasadena Society of Artists and the California Art Club. 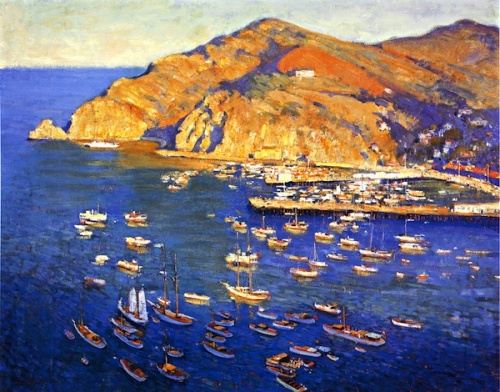 Alson Clark's painting, Catalina, painted in multiple studies, shared the 1924 Huntington Prize, an annual award given for the most popular painting at the California Art Club exhibition. He also painted several murals for schools and public buildings, and was the art designer for the Pasadena Playhouse, opened in 1925. Clark died while painting in his studio on March 23, 1949. This page was last edited on 8 October 2016, at 18:54.